Dr Sarah Miller, CEO of the Rediscovery Centre and WISER LIFE Project Manager explains the objectives behind the project as the 3-D textbook comes to life. 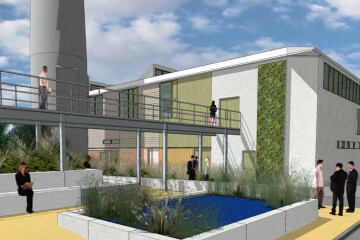 The WISER LIFE project (Working with Industrial Spaces to Exemplify Reuse) is a Rediscovery Centre research initiative, funded by the European LIFE programme; the EU’s financial instrument supporting environmental, nature conservation and climate action projects throughout the EU, and facilitated by co-funding from Dublin City Council and the Department of the Environment, Community and Local Government. The project is to convert the iconic Ballymun Boiler House into a “3-D textbook”. Our aim is to lead in the creation of an innovative educational space, that promotes the use of the physical environment as a 3-D textbook; showcases best practice in reuse; and, signposts the direction towards a resource efficient Europe. This is an innovative take on educational space, where the built, cultural and natural environment serve as an education tool. It will incorporate active learning through its design, construction, operation and occupation inspiring our thoughts, actions and reactions to the environment around us. Promote positive behavioural change by demonstrating good practice with respect to waste generation, the use of natural resources and recognising the value in waste. Support the implementation of national and EU waste policy through operations, communications and education. The test-bed afforded through this project is unique. It will involve the redesign of a building, originally constructed to dissipate heat and associated with an inefficient district heating scheme, to best practice energy management standards, incorporating innovative and experimental technologies and platforms. This project has the potential to educate and influence the behaviour of its visitors and create solutions for sustainable development, which can be applied at a local and a European Community level. On completion, the repurposed Boiler House will serve as the new premises for the Rediscovery Centre; housing its 4 social enterprises in addition to a raft of education and research programmes. This project will preserve an iconic landmark, provide necessary waste infrastructure for the community and create local employment. The WISER project promises a design that will enrich social, economic and cultural life and will be a celebration of the positive impact design can have on its community. Thank you to all who have supported the project so far and we will keep you posted as we move towards the completion date in October 2016.